Avulsion fractures of the pelvis may affect the anterior superior iliac spine, the anterior inferior iliac spine, or the ischial tuberosity. The sartoris muscle originates at the anterior superior iliac spine. The rectus femoris muscle originates at the anterior inferior iliac spine. The hamstring muscles originate at the ischial tuberosities. The osseous structures are generally avulsed in young, athletic individuals. These fractures are also known as sprinter fractures. 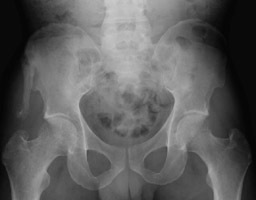 A AP radiograph of the pelvis. This demonstrates a prior avulsion of the right anterior superior iliac spine. The avulsed fragment has healed with some deformity to the iliac wing. 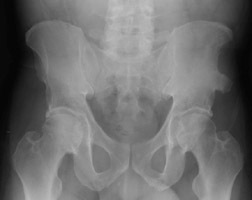 B AP radiograph of the pelvis. This shows a prior healed avulsion fracture of the anterior superior iliac spine.